The spicy shakshuka is worthy of a fan club. Until recently, Berkeley was largely bereft of the all-day cafe, establishments where the menu spans breakfast, lunch, and dinner; the design is Instagram-ready; and the patrons can often be found tapping away at their laptops. 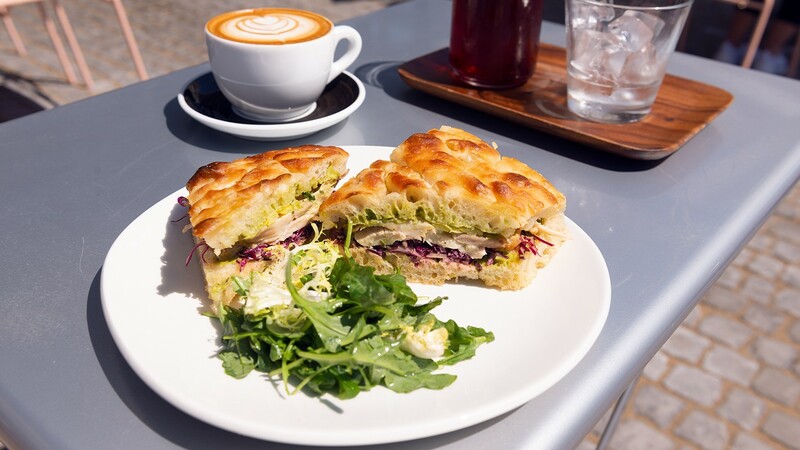 Now, with the arrival of Cafe Réveille, part of a small chain of cafes originating in San Francisco, East Bay diners can get a taste of the increasingly popular fast-casual restaurant model. The genre of the all-day cafe probably owes its inception to Sqirl, Jessica Koslow's now-famous Los Angeles establishment where Cafe Réveille's chef, Juliet Orbach, worked in the past. At the all-day cafe, the menu gets heartier toward lunch. And while other Reveille locations do serve dinner, Berkeley's outpost currently closes at 3 p.m. and offers breakfast, lunch, and weekend brunch. Wi-fi is still in the works, but that doesn't stop customers from working here. On the plate, the sandwiches revealed Réveille's messier side; I opted for the ones featuring the house-made focaccia, which, for its satisfying texture and flavor, merely framed the ingredients rather than containing them. The best of the bunch was the beef mi, an energized twist on the banh mi, with accurately grilled beef, matchsticks of cucumber and carrots, and a creamy crème fraiche speckled with chives. It was a well-executed, tangy-salty affair. Both sandwiches left me pining for extra napkins, chin dripping with juices and spreads. Only the turmeric hummus sandwich wasn't worth the trouble, being not as bright and thought-out as its meaty companions. You wouldn't expect a place like Reveille to forgo one of the year's buzziest ingredients, but beautiful turmeric doesn't pack much flavor, and needs more than avocado and arugula to shine. The shakshuka was far more successful. 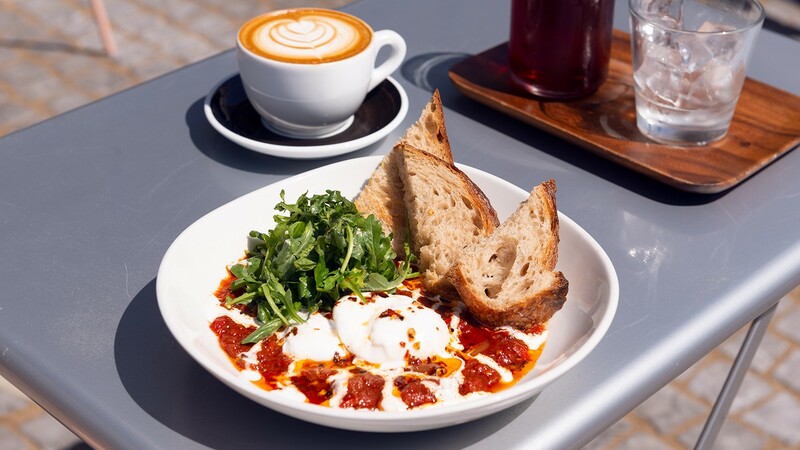 A popular Israeli breakfast dish, this rich union of eggs and tomato-based sauce has become a staple in all-day cafe menus. At Reveille, the layered, smoky sauce of red and yellow peppers, tomatoes, and onions was quite spicy, just enough to jump-start a foggy morning. While some shakshuka techniques require simmering the sunny side up eggs in the sauce, here they were poached and perched on top of the sauce, lacing it with yolk when pierced. This — as well as a heap of peppery arugula, accenting the tomatoes — was a fun twist. The accompanying yogurt came in handy, serving as a cool pause. The cardamom brûlée French toast had a lot going for it, too: The large chunks of Acme's Italian baguette, with less cardamom traces than I'd like, were served with saffron whipped cream (more yellow, and more flavor this time), fresh berries and oranges, and bits of pistachio and dried roses. Some ingredients were for show, but the saffron cream and the fruit played out nicely. The toast itself was on the dry side, but if your Saturday-morning fantasy includes an non-boring, grease- and guilt-free French toast, Réveille's would be a good place to start. The Levantine sandwich comes with a thick layer of schoog. Hours: Mon.-Fri. 7:30 a.m.-3 p.m., Sat.-Sun. 8 a.m.-3 p.m.